I tested them all out in sketch book, to get a feel for how they layer and dry, and the finish and colour. Here are some close-ups of each of the testers. 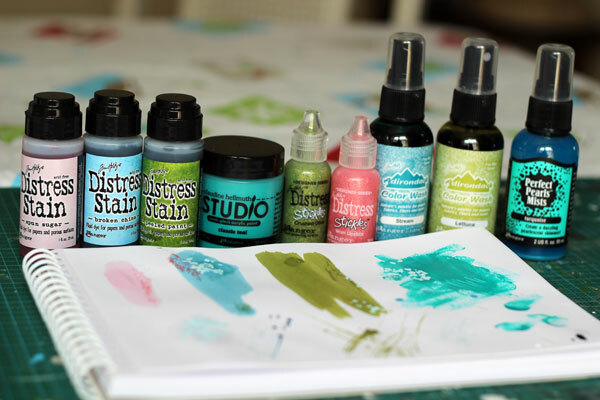 On the left is Distress Stain in Spun Sugar with Worn Lipstick Distress Stickles over top. 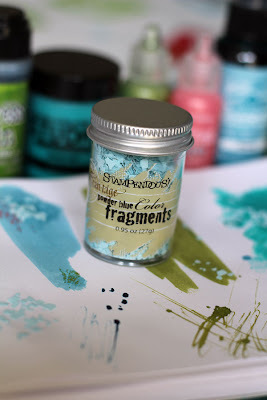 On the right is Broken China Distress Stain with Worn Lipstick Distress Stickles and Stampendous Powder Blue Color Fragments. This is the first time I've used either Distress Stickles or the Color Fragments. I love the fragmented, shiny quality of the Distress Stickles. They catch the light nicely and have a great grainy texture on the page. 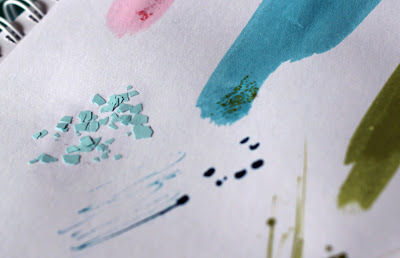 Color Fragments are not shiny or glittery and remind me of broken egg shells. 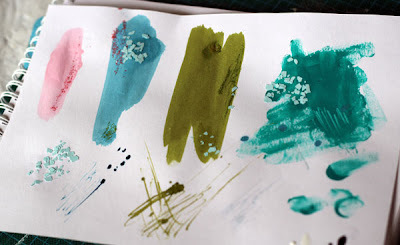 They provide a very unique texture and finish on the page. 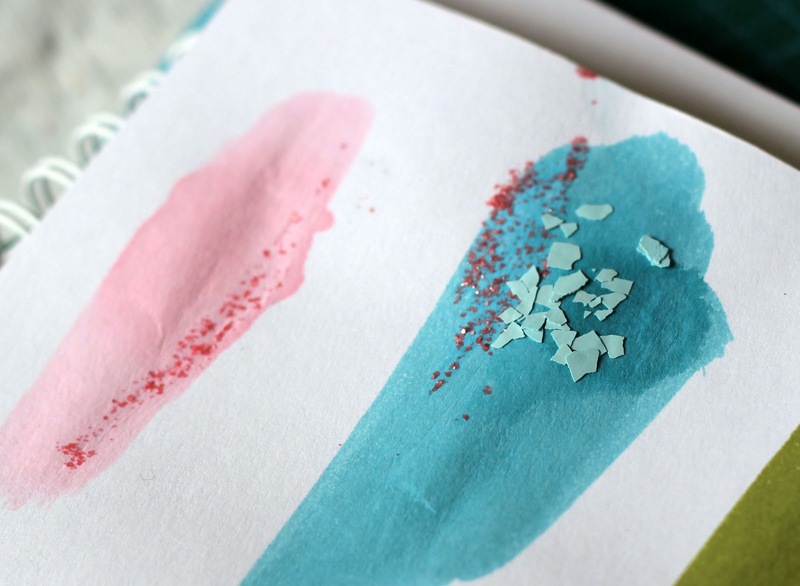 Left: Peeled Paint Distress Stain with a tiny bit of Crushed Olive Distress Stickles and Powder Blue Color Fragments. Right: Claudine Helmuth Classic Teal semi-gloss acrylic paint. 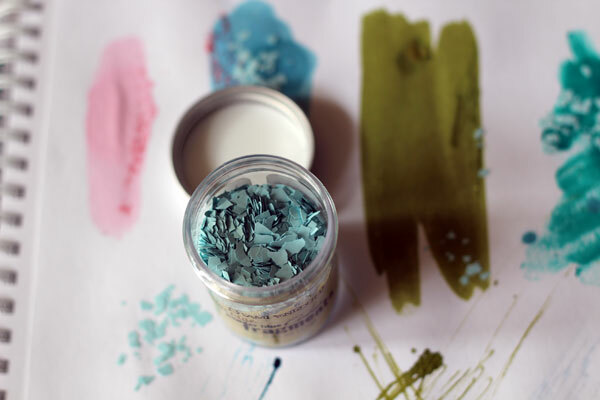 This paint holds texture and has a very small amount of sheen. Actually, it is less gloss and more like a lack of matte finish. 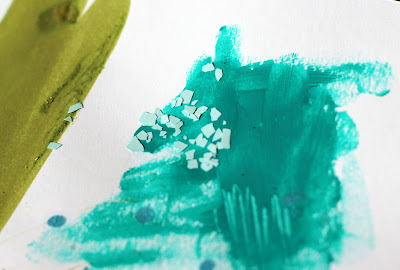 The blue dots along the bottom of the photos over the teal acrylic paint are dots of Turquoise Perfect Pearls Mists that I just dropped on the page. These are truly iridescent! This mist has a very fine shimmer. It sort of flashes in the light rather than showing multi-coloured glimmer like many iridescent finishes do. 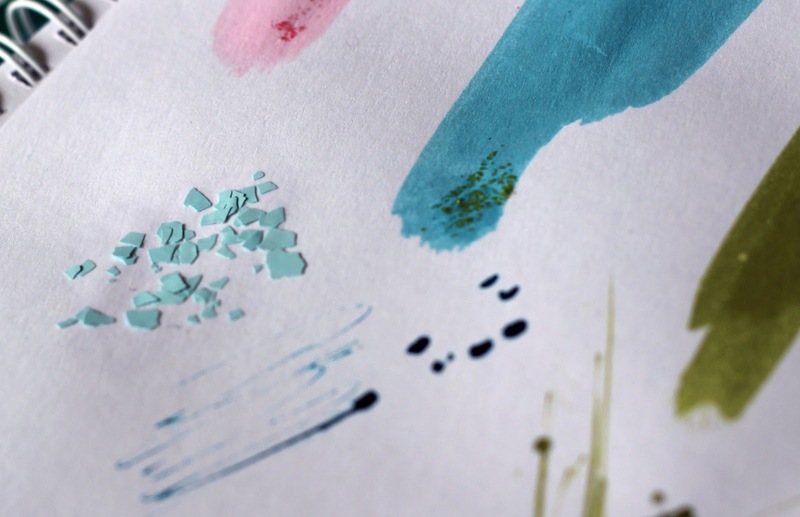 On the left are Colour Fragments on the bare page. I used the applicator for the mists to apply directly to the page. Stream Color Wash is shown on the left, and I like the inky look of this mist. The bottom right scratches are Lettuce Color Wash. This mist is nearly identical in color to the Peeled Paint Distress Stain, shown on the right side, halfway up.